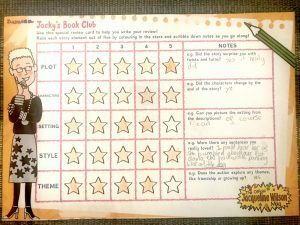 Congratulations to our second group of fabulous Star Reviewers from the Official JW Book Club! These readers entered the prize draw in issue 129 and won a copy of either Queenie by Jacqueline Wilson or Journey to the River Sea by Eva Ibbotson. They’ve read it and reviewed it to let us know what they thought! Have you read these books? What did you think of them? Let us know in the comments! Read all about why Jacky chose these books in issue 133 of The Official Jacqueline Wilson Magazine on sale now, and see quotes from all the reviewers featured here. You can also find out how to enter the prize draw to be a Star Reviewer yourself! The book, Queenie, is an intriguing novel by the famous author Jacqueline Wilson who has worked as a writer on the Jacky magazine. This book is about a young girl named Elsie who has tuberculosis of the knee. She is stuck in the hospital and has no idea when she will be able to return home. This amazing book will hook the reader within seconds. Its main character, Elsie, becomes best friends with the fluffy and cute, snow-white cat, Queenie, who lives at the hospital. Queenie loves to jump up onto Elsie’s bed every night and she keeps her comforted whilst her precious elephant teddy is being fumigated by the ugly and cruel nurses that rule the children’s ward. Elsie’s worst nightmare of going to the toilet with anyone watching or listening comes true. The nurse announces that she will have to use the bedpan and do her business in front of everyone on the ward. She can’t stand the annoying boy named Martin who is covered in splints from head to toe but is still as mean as ever. She writes hundreds of letters to her nan to say how much she misses her and gives her updates on her life and how her knee is healing. She loves it when she gets a reply from her nan and adores the days when her mum comes to visit her. She can’t wait for the day when she can go home and see the Queen’s coronation with her beloved nan. In conclusion, this book is great for older readers. You shall not be disappointed, you will not want it to end and just want the story to carry on forever. This book can be found in your local book shop. Elsie is stuck in Miltree Orthopaedic Hospital. My favourite character is Nurse Gabriel because she is Elsie’s best friend at Miltree. Martin and horrid Nurse Patterson are really unkind to Elsie and I hate them. There is a puzzle in this book that YOU need to work out. I really enjoyed the end of this book. I liked it but it was a bit scary when Nurse Patterson was unkind to Elsie and when she left her in the bathroom all night. I loved the characters and my favourite was Queenie because she loved Elsie and she was caring for her and always jumped up on her bed. I liked the setting because I could picture it in my head that Elsie was in the hospital and I could picture Queenie because it has loads of adjectives in. I like the style a lot because there were a couple of sentences I really liked. I learned how to be with, and help, other children. The story surprised me at the end and it made me cry! I really liked the matron because I could really picture her mean ways! I can really imagine the hospital and what the sanctuary must have been like. It made me step into Elsie’s shoes. The author describes how important friendship is and what life is like when family members are ill. Journey to the River Sea by Eva Ibbotson Is an AMAZING book. There are loads of exciting twists and turns along the way. The way Eva describes the book makes you feel like you’re really there. This book is full of adventure and friendship plus just a touch of tragedy to even it out! The way it’s written flabbergasted me, but in a good way. I would recommend this fantasamazinglybrilliant book to anyone. If I had to give a rating of five stars for this book I would give it… Five! Journey to the River Sea was really enjoyable to read. The book is about two children who sail over the river sea on a cruise ship. Maia is an orphan at The Mayfair Academy for Young Ladies, a school that teaches students whose parents were abroad and needed a place for their young lady to stay. The story surprised me a lot and also confused me. It is one of the most exciting stories I have ever read. One of my favourite settings has to be the cruise ship in chapter 2. I started focusing on these chapters a lot as they answer a lot of the questions I had about the book. Maia describes the cruise as a “beautiful ship; a snow-white liner with a slender light blue funnel.” This sentence made me feel like I was on the ship, and looking straight at it as if I was meeting my distant relatives in the Amazon too. At the start of the story, Maia is an orphan and she has been for a long time, but then she goes on amazing adventures. I definitely think Maia changes – she goes from bored to being excited at everything. One of my favourite sentences has to be, “But then a little packet came from England, with the greatest prize he had yet seen – a double set of navy blue eyes.” This sentence was from chapter 16 and it has to be my favourite. The author has explored the themes of compassion and kindness. She has also shown that adventure is everywhere. Just seek and you will find. I liked the plotline of an orphan looking forward to meeting her relatives living somewhere in the Amazon. There were twists and turns, although many seemed to end in a predictable way. The characters were so well described that I felt like they were in the same room as me and that I really knew them! The author looked at what trust and friendship between the characters meant. The best thing about the book was the detailed description about the Amazon journey – it was magical. I’ve never been to that part of the world but I really want to go now! The chapters were not in order so sometimes you were left hanging for a while on a situation, which made the book more interesting to read. I loved the book and hope to read some more by this author. This book is about an English girl called Maia who travels to the Amazon as an orphan to live with relatives. She is excited to meet her twin cousins, Beatrice and Gwendolyn, but they are not what she expected. Her governess, Miss Minton, is strict but kind and helps Maia understand her new surroundings. After an adventure involving a young English actor, a missing heir, a museum curator and two detectives, Maia comes to love her life in the beautiful Amazon. I really enjoyed this book because the characters felt real to me. I also enjoyed it because it taught me about a different part of the world that I now want to visit! My favourite character was Maia because she is brave, caring and eager to learn. I also like her governess Miss Minton because she is very independent, encouraging to Maia, and always has good books. I think the setting of the story is one of the best bits about this book. I like the way Eva Ibbotson makes it seem that the Amazon is right in front of me. The style of the story was very descriptive which made it feel so real and alive. Overall, I highly recommend this book for both children and adults because it is so enjoyable and exciting. Overall, I really enjoyed reading this book. The story had a lot of surprises. I especially liked the part when Maia found her Governess. I thought Maia’s character changed quite a lot from the start of the story to the end of the story. The story was described in great detail and I could picture the scenes really well in my head. If I were to go to Brazil I would really like to try the roasted sweetcorn. Maia makes many friends including Beatrice and Gwendolyn and they form good friendships. I am looking forward to reviewing the next book, I hope it’s as good as this one. Well, at first, I thought all was well, until I met the Carters that is! I strongly suggest that Mr Carter be put into prison – he doesn’t pay his taxes! My favourite character is Miss Minton because she is a strict but supportive character. Anyway, I think this book is a decent, well-written book and should be a classical novel and win many awards e.g. Costa Book Awards, British Book Awards and BAFTA Children’s Awards. I also think Maia (the main character) is nothing short of amazing because it takes a lot of courage to go up the Amazon with a random boy from an Indian tribe! 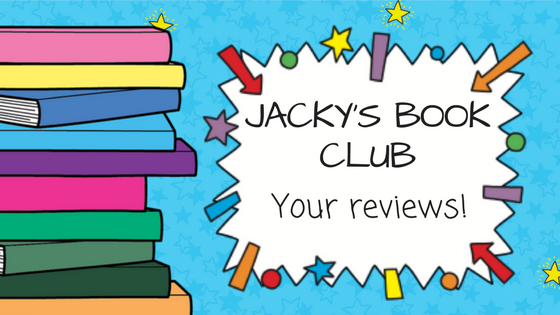 Previous story The Official JW Book Club – Star Reviews!